Testing the waters for UNGASS – are parliamentarians ready for a change in international drug policy? PRI’s Policy Director reports on a Hearing of the Inter-Parliamentary Union on world drug policies, part of a preparations for the forthcoming UN General Assembly Special Session (UNGASS) in April. I recall vividly the lively debate and the many interventions from MPs who expressed their frustration that far from the problem being addressed, there were more drug users, more weapons and bigger markets, causing more harm to the most vulnerable. The link with poverty and inequality was mentioned a lot, which amongst other things, provided organised crime with a huge base of poor people they could recruit from. One intervention I remember particularly was from a Latin American MP, who said that the ‘war on drugs has been a war on poor people’ and that it was a ‘political construct as opposed to an evidence-based construct’. 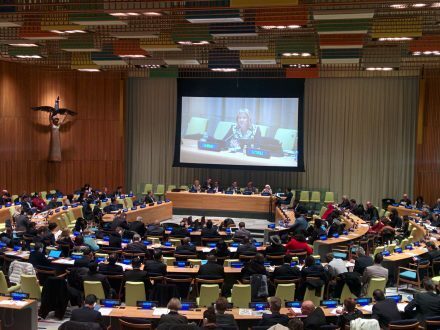 Two years later, the IPU got together again to discuss global drug policies, this time at a two-day Hearing in New York on 8 and 9 February 2016 in advance of the UN Special Session on drugs in April. The debate was again lively, with MPs from all regions participating and taking the floor. The Hearing started with opening remarks by the President of the General Assembly, the President of the Inter-Parliamentary Union and the Executive Director of the UN Office on Drugs and Crime. A first session on ‘The evolution of drugs control’ was followed by one on how the system could work more effectively, and a third panel was convened on ‘drug prevention and treatment from the standpoint of sustainable development and human rights’. It is impossible to summarise here the deliberations of the two-day hearing, since the topics at hand were very diverse, ranging from development issues, healthcare and harm reduction and criminalisation, to social issues causing or caused by drug use, rehabilitation, money laundering and corruption, and international cooperation including joint border operations. The MPs’ views and opinions varied hugely – from fierce defence of the international drug conventions and their approach of criminalisation to interventions highly critical of the current framework. Strikingly, the death penalty, currently handed down as a sentence for drug-related offences in 33 countries and responsible for about 1,000 executions annually, was hardly mentioned, and the particular impact of the ‘war on drugs’ on women was only picked up following a question to the panellists. Also strikingly, little time was dedicated to discussions on the lessons learned in other policy areas. One exception to this, however, was a Canadian MP who called on his peers to look at lessons learned from policies relating to tobacco and alcohol, noting that in the case of tobacco, where the approach had always been regulation rather than total prohibition, investment in education had shown good results, whereas alcohol prohibition in the 1920s had only driven the trade underground and fuelled organised crime. There were other interventions claiming that criminalisation has ‘worked’, and some panellists and MPs in the audience reported – proudly or as a matter of fact – on the various measures which their country had taken to implement the drug conventions. However, frustration over the existing drug control framework was omnipresent and statements denouncing the approach taken by the drug conventions as ineffective were frequent. As I listened to the interventions on the panel and those of MPs from the floor, I could not help but recognise that where they raised – and praised – law enforcement and prosecution, the interventions explicitly or indirectly referred to drug trafficking, to the high-level kingpins and organised crime, linked with corruption and other criminal activities such as human trafficking and illicit arms deals. This is striking as global statistics tell us that 83 per cent of people incarcerated on drug-related offences are locked up not for trafficking offences, but for drug use or possession, and that even amongst the remainder, the convicted traffickers are mostly low-level offenders. Policy-makers appear to want their (criminal) laws to clamp down on traffickers, on the ‘sharks’ in the drug trade. Yet, as with many issues relating to drug policies, intentions and actual practice have diverged sharply. The Hearing concluded with a final session with an unusual and interesting format. Two participants defended and objected to two motions, followed by a mock vote. The first motion that ‘implementing the international legal framework will address the world drug problem’ was adopted by the Parliamentarians present. The second motion that ‘states should seek alternatives to incarceration when addressing possession of drugs for personal use’, ended with a draw. The exercise was not an official vote and the moderator gauged the results from a show of hands, but the outcome provided an interesting insight into the minds of Parliamentarians, at least those attending the IPU Hearing. Personally, I doubt that a couple of years ago there would have been a draw on the introduction of alternatives to incarceration for drug use. I think there would have been a solid majority for imprisonment. Perhaps, some five decades into the ‘war on drugs’, people are now realising that more harm has been done by the drug control regime than by the drugs. This briefing discusses the negative consequences of the 50 year 'war on drugs' and sets out what parliamentarians can do about it.